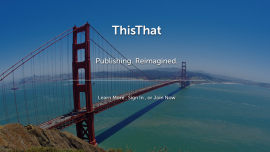 ThisThat - Reddit for blogging. Then along came http://getprismatic.com. They did pretty much what we were trying to do, but using big social data instead of data retrieved directly from users of the site (like us). This effectively solved the chicken-and-egg we'd been struggling with month after month. They also all have PhD's or something. Out of the following turmoil (which included founding a few other startups and attending DreamIt Philly 2012) emerged a new idea - still based on the idea that web content is more useful and engaging when grouped with similar content. The idea, at its heart, is a simple one - "if you like this thing, maybe you'll like this other thing, too." Posters don't have to build / maintain a following to get an awesome post in front of people. If readers enjoy a particular post, that post is always part of a larger channel, allowing discovery of new, relevant content. The creation of communal spaces invites more creativity - readers who like a given post are often inspired to post to that same channel. We have not formally launched. We're iteratively building the product and inviting friends and family to join. a. Publishers - want to increase the # of readers consuming their content. Everything is sorted by popularity by default. Therefore, publishers also want to increase the # of people recommending their content, so their posts show up higher in feeds and increase readership further. They can do this by inviting their friends to the platform to read and recommend their posts. [#4] Publishers produce content for other people. Ego is also a factor here. a. Publishers - Subscription model for premium publishing tools. Charge for extra exposure (some sort of advertising). Hook into publishing outside of ThisThat (ebook, amazon, physical book, physical portfolio for photos, etc).